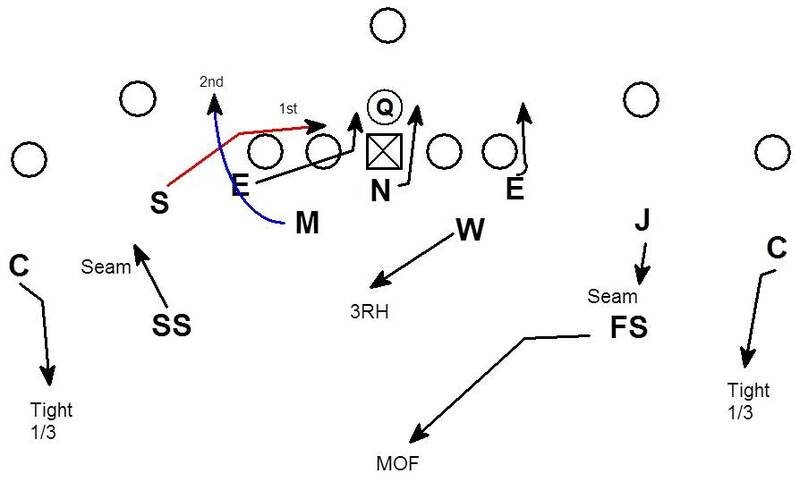 Here is a zone dog that is a variation of America's Blitz . 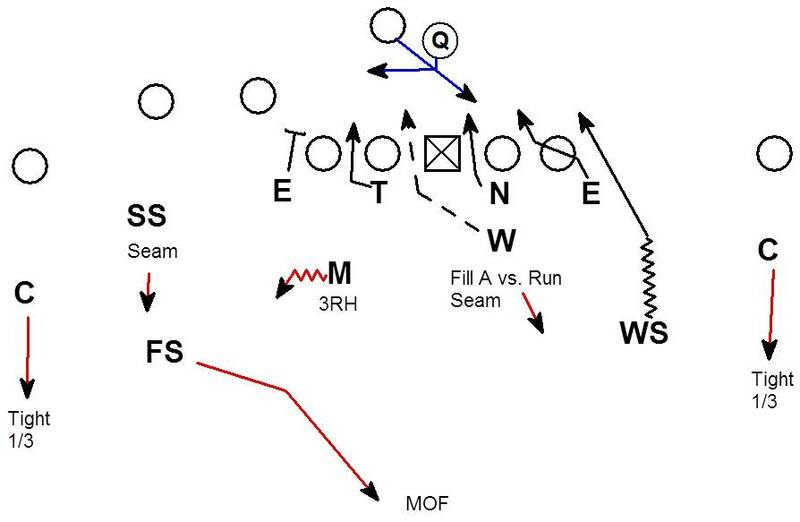 This article is a follow up to the post about 3-4 pressure to attacking the run game. The three down linemen are exactly like America's Blitz. The difference is path of the 2 rushing linebackers. Mike - Go 1st and Rush contain. Also can be run by Mike walking up to show the pressure. Sam - Rush flat off the edge at an angle to replace the heels of the rushing Mike. Spill any blocks (Never Kicked). This technique was covered in a previous post here. 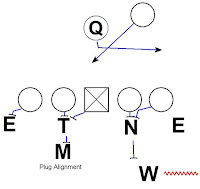 Against 3x1 the the linebacker's bump to a stack alignment and the Mike and Will switch responsibilities. 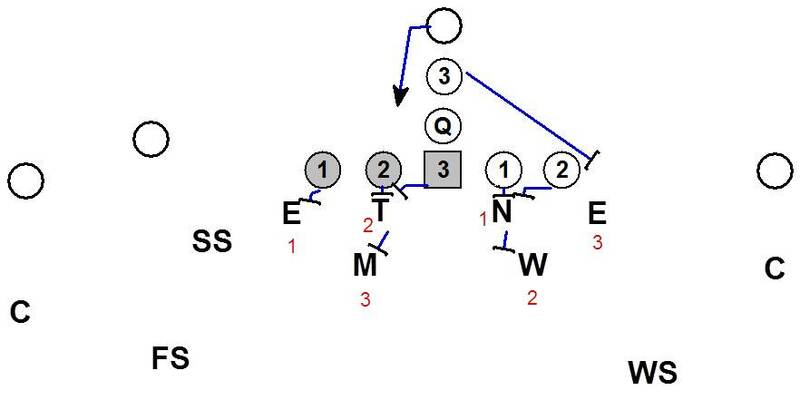 This concept is good for attacking traditional 3 down line drop back pass protection schemes. This pressure is designed to get the Sam an opportunity to attack the protection. If the Sam is our best pass rusher we want to create 1 on 1 pass rush opportunities for him. 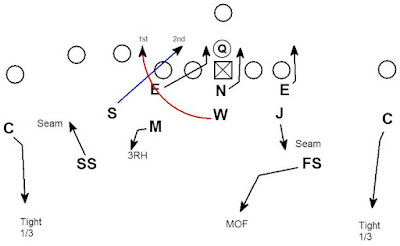 In a man protection scheme like BOB the offense will lock the Center on the Nose and fan the Guard and Tackle out for the Sam and End (2 blockers for 2 rushers). In that case the Guard is forced to redirect after setting out to block the long stick End. The OT is 2 on 1 vs. the Mike and Sam. Pass protection schemes typically want to block the inside rusher first because that player has the shortest path to the QB. 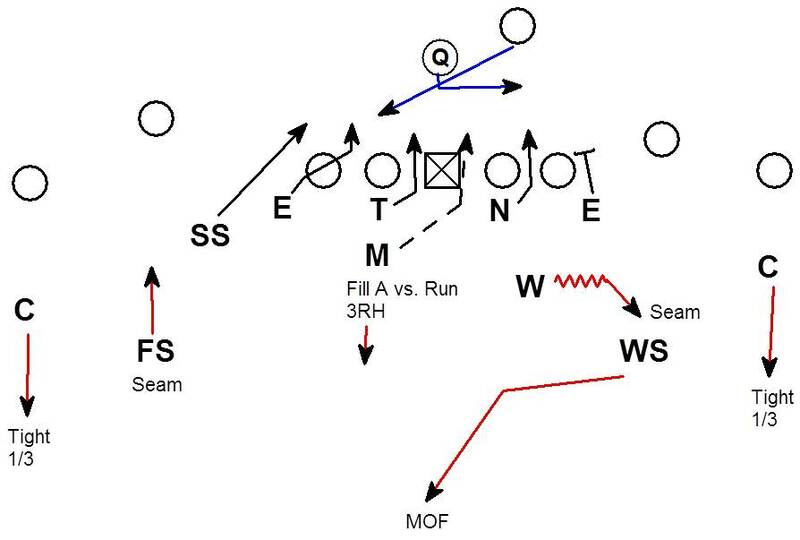 In this case the order of rushers creates a situation where the inside rusher (Sam) is running through with the the RB as the likely blocker. 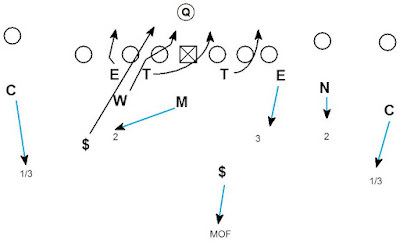 Molly is a form of man pass protection where the OT will lock the DE. The Guard has a dual read from ILB to OLB. Again the offense wants to protect against inside rush threats first. If the Mike rushes inside the Guard will block inside. If there is no inside threat the Guard will set over the top to the outside for the OLB off the edge. 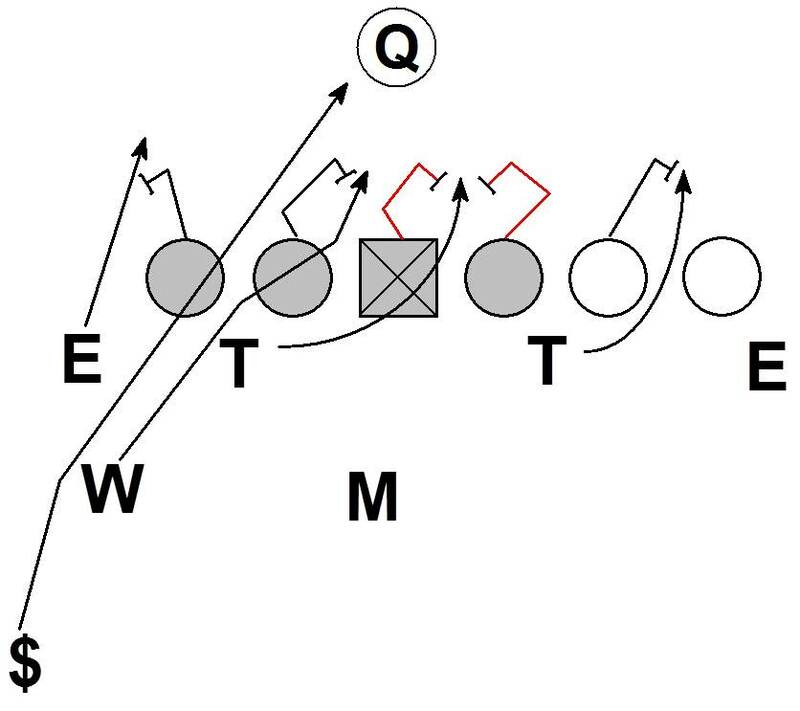 Here the Guard is forced to set over the top to the Mike which allows the inside rusher (Sam) the short run on the QB and a potential 1 on 1 with the RB. 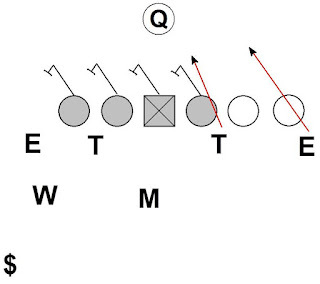 A zone protection scheme like half slide allows the offense to get a 4 on 4 vs. the pass rush. The offense has the numbers and angles to block the pressure from a half slide protection. 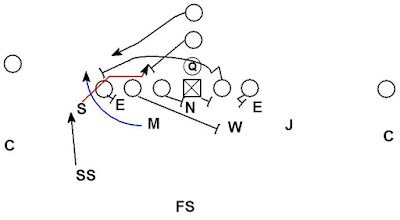 Half slide is a strategy that can block 3-4 America's blitz variations. 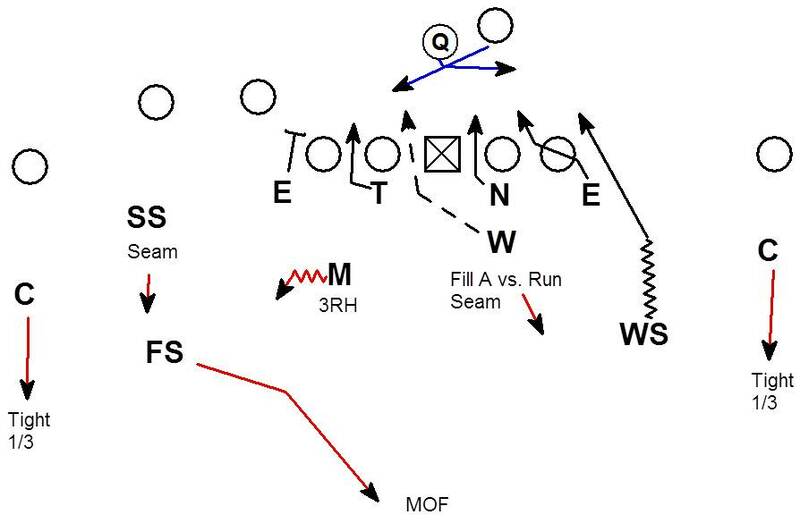 If the defense is planning on attacking BOB man schemes but the offense is using zone half slide protection instead having a couple in game pressure adjustments can help keep the heat on. Bluff is a pressure disguise concept that was discussed in a previous post about disguising pressure in the 3-3 stack and applies to 3-4 pressure too. On a bluff call the non-rushing backer opposite the pressure shows in the B gap. 1/2 slide protection rules typically dictate the 1st uncovered OL starts the slide. In this case by covering the guard opposite the pressure the guard is forced to be part of the man 1/2 of the protection as is the Center. By forcing the Center and Guard into man protection, bluff can get the pass rush numbers back to 3 (End, Mike, Sam) vs. 2 (OT & OG) to the pressure side. When the offense is in 3x1 the defense adjusts with a switch call. On a switch the Jack is the non-rushing LB away from the pressure and shows in the B gap to control the 1/2 slide protection. X is a tag that adjusts the away side of the pressure. The X tag adds a twist by the End and Nose away from the pressure. When the offense chooses to slide the protection to the pressure, the OT opposite the slide is in man vs. the DE. If the defense has a good pass rusher at DE, the X tag can be a good way to create a 1 on 1 inside rush opportunity for him. The Nose attacks the midline initially to force the guard to set aggressively and widen the B gap for the End. The Nose rushes the midline until the End enters into his vision on the inside pass rush then loops to contain. Carrying adjustments like bluff and X are good way to build a pass rush plan. 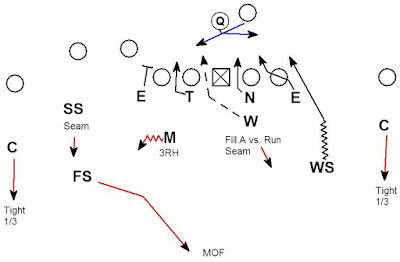 A primary plan may be to attack an offense's base man pass protection scheme. 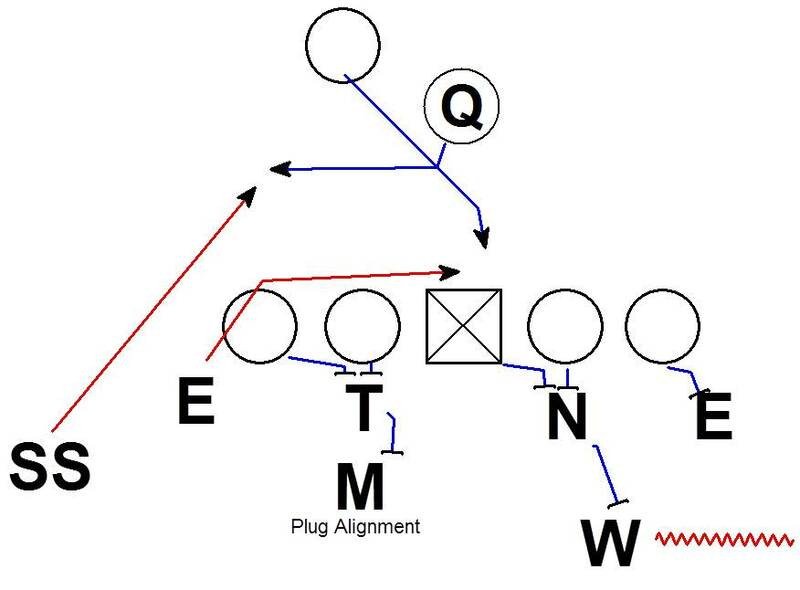 Having simple adjustments ready for when the offense adjusts to a zone protection scheme is an easy way to build a 2nd pass rush plan for in game adjustments. 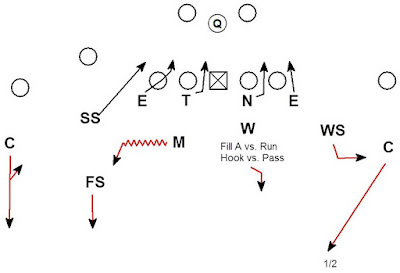 Here is an overload zone dog used by the Carolina Panthers in 2013. The dog is backed up by 3 under 3 deep zone coverage. 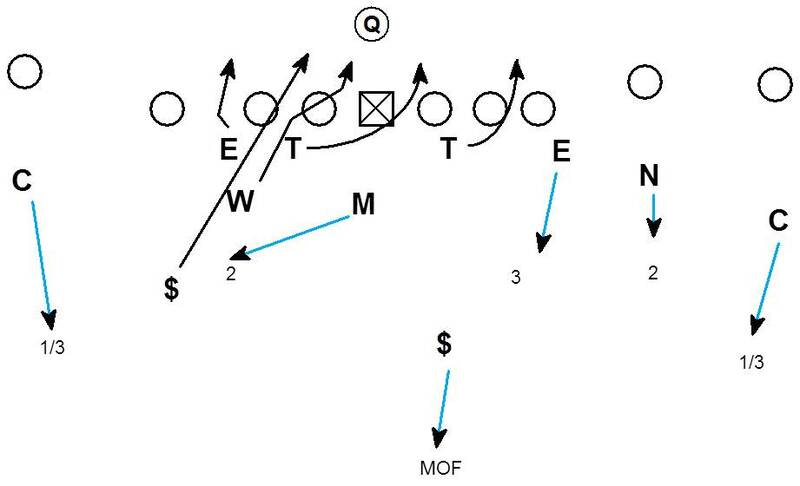 The RB motions to empty and the Panthers run an overload to the defensive left side. The rush sends two through the B gap. The Panthers rush 5 against a 5 man pass protection scheme. The offense has enough blockers but the rush scheme violates the rules of the protection. Initially the Guard and Tackle are forced to set to the right to block the DT and DE. That leaves 3 blockers to the left (Center, Guard, Tackle) to block 4 rushers (DE, DT, Will, and Safety). The offense could pick up the rush if the OL was sliding to the pressure. The offense doesn't know the End is going to drop off into coverage. Therefore it is impractical for the offense to slide to the pressure and risk leaving a DL unblocked. If the OL slid when the Panthers were rushing 4 down linemen, the DT and DE would have an easy 2 on 1 vs. the RT. 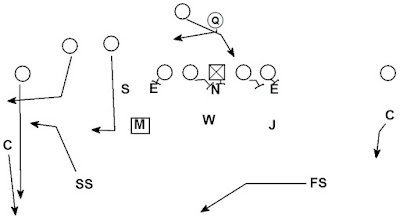 The RG initially set to the DT. Once the DT worked outside to contain, the guard was able to redirect and block the long stick DT from the pressure side. Once the RG redirected the offense had 4 blockers for 4 rushers. The challenge for the offense is the Center has to travel back with the long stick DT. The Center set to the pressure initially and has no way of knowing the End opposite the pressure dropped into coverage. If the Center let the long stick DT cross his face, there is no guarantee the guard will be there to help. Pre-snap the protection rules are the RG and RT need to block the DT and DE. The Center has no way to know that is no longer true. 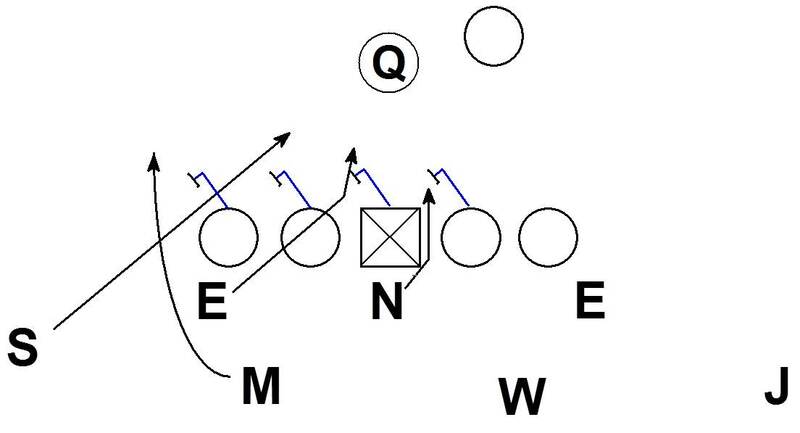 Once the Center traveled back the defense created a 2 on 1 for the LG. The guard is also forced to travel back with the Will. The LG has Center help allowing him to pass the long stick DT to the Center. The Will rushes the B gap and the guard sets to him. Once the Will makes an inside move; the guard is forced to travel back with him. 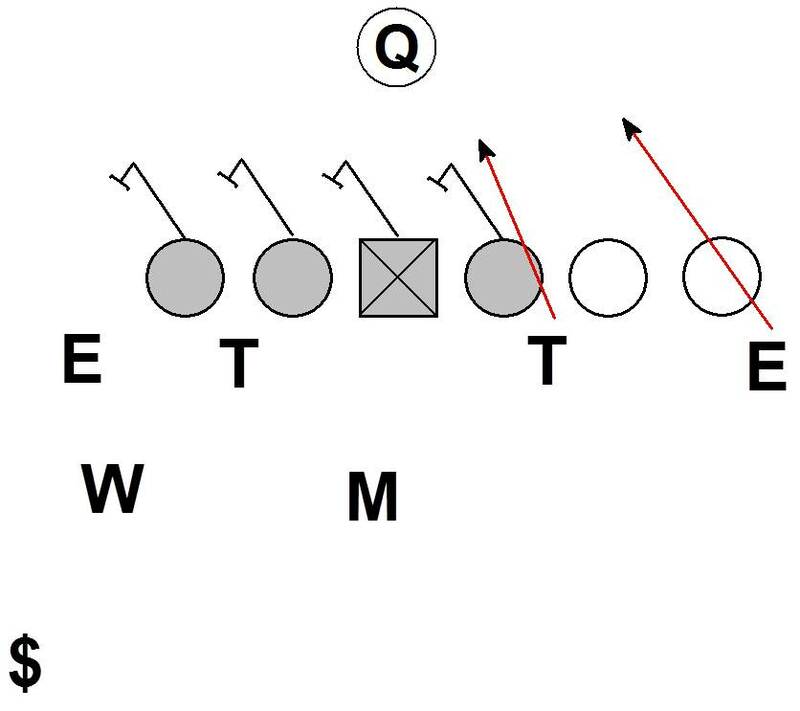 The guard can pass 1 inside move to the center, he cannot pass 2 inside rushers. That leaves the safety rushing from the secondary on a clean run through for the sack. This pressure is a good reminder about the nature of bringing pressure. There is a balance between coverage and pass rush. The more coverage the more time the rush has to get home. The more pressure the less time the coverage needs to cover. Some coaches are tentative about dropping a DE into coverage, thinking he will be a major coverage liability. The expectation of the DE as a pass rusher sets the OL's protection rules. Dropping the DE into coverage allows for an overload rush that attacks those protection rules. While 3 under 3 deep zone coverage is not perfect, dropping a DE does allow for overload pressures that can cover up those imperfections. There is more than one strategy for creating negative plays. 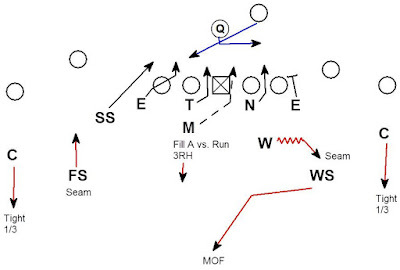 This post focuses on the strategy of attacking a specific blocking scheme. In this case the scheme being attacked is inside zone. 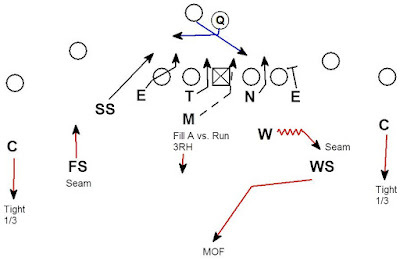 Here the offense is running split zone. 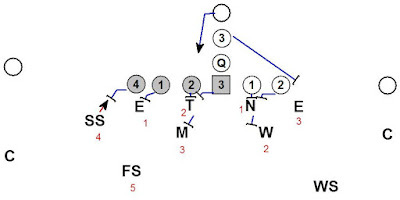 The offense has 3 blockers for the play side 3 defenders and 3 blockers for the away side 3 defenders. The core is blocked in the diagram. If the SS is pressuring off the edge, the offense has a numerical problem. The defense is now presenting a 4th threat play side who is not blocked at the point of attack. This creates the potential for a negative yardage play. 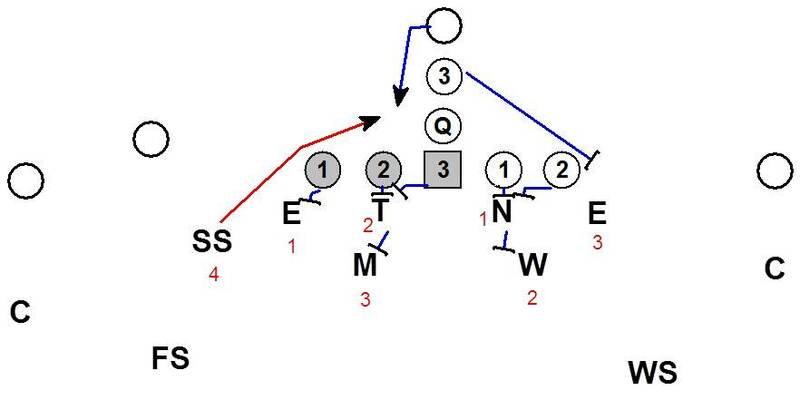 The offense can ask the split #2 WR to block the blitzing SS. This is a difficult block. 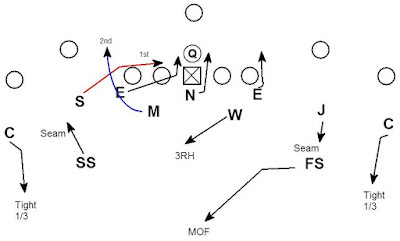 The angle of the block pushes the blitzer into the play. If the SS does a good job with his alignment, timing, and blitz path, the blitz should be disruptive. The pressure doesn't have to be create a TFL by the SS to be a success. 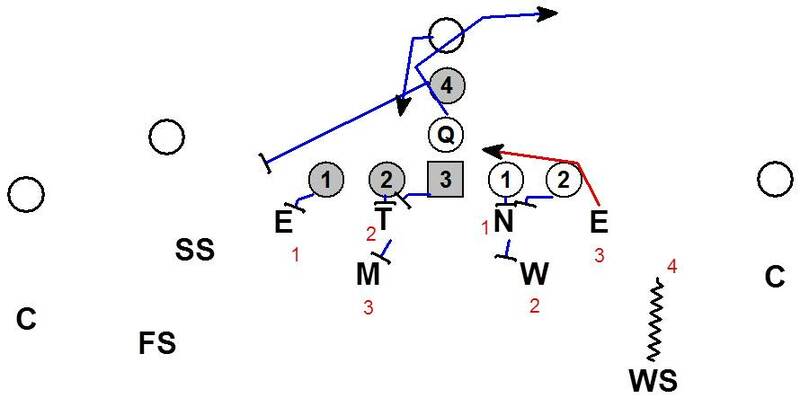 If the SS can simply force the RB to change direction in the backfield the chances of a negative play go up. 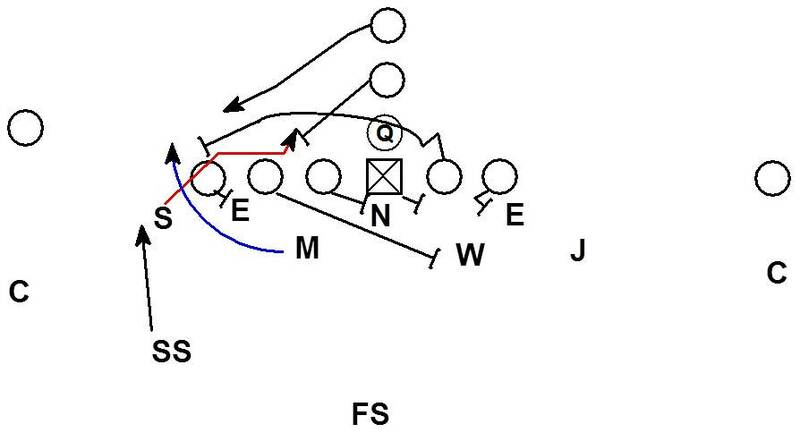 If the WR is unable to make the block, one solution for the offense is to reduce the split of the WR. Moving him closer to the core. Anytime the offense brings another body into the core the defense is able to bring one more too. 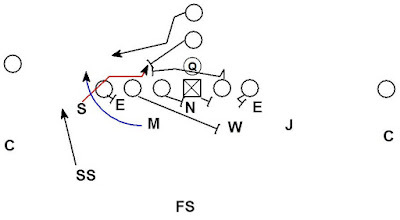 In this case the FS become a 5th defender to the play side. The slot WR is now in the core. Many slot receivers do not want to go mix it up in the core. If we can get the offense into a place where they are using their personnel in a sub-optimal role that is a success. 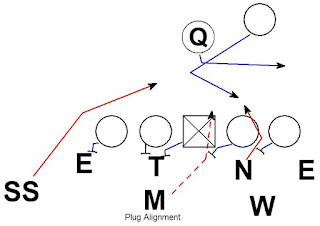 The change in the WR's alignment can tip the play. 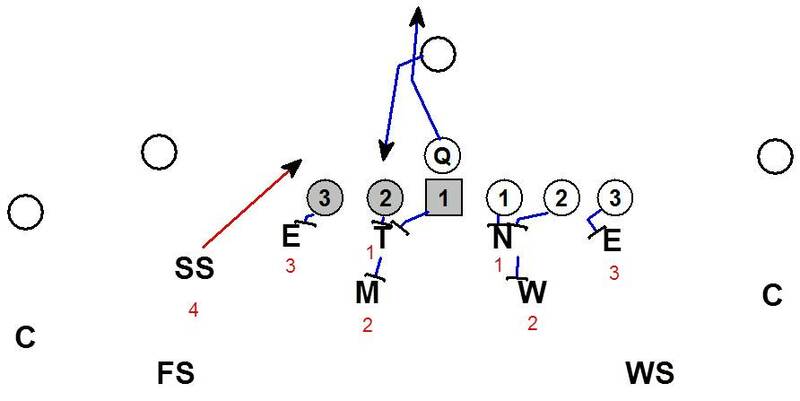 The new alignment can affect the spacing and timing of pass routes the offense wants to run. 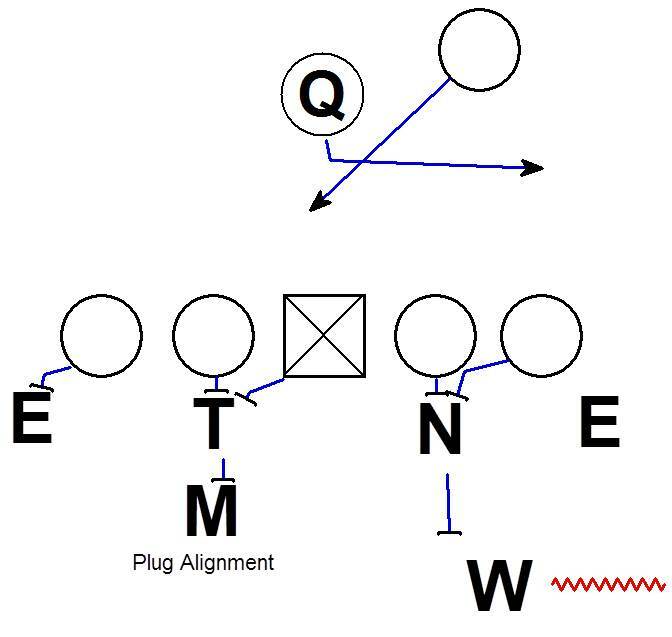 The altered alignment may also create problems for other run blocking schemes the offense wanted to run from their original alignment. If we can get an offense into a choice between running split zone and running those other plays, we are creating the offensive limitation we want. The offense could opt to change personnel. Using a TE instead of a WR allows the offense to have the alignment they want to pick up the SS pressure. 20 personnel may be their best personnel grouping. If the slot WR was one of their best 11 then getting him off the field is a success for the defense. Now the offensive limitation is based on what can the offense run from 21 personnel. What plays from 20 personnel are no longer available? The offense may be committed to staying in 20 personnel and running twins from their normal split. In that case the offense can elect to use the FB on the pressuring SS. 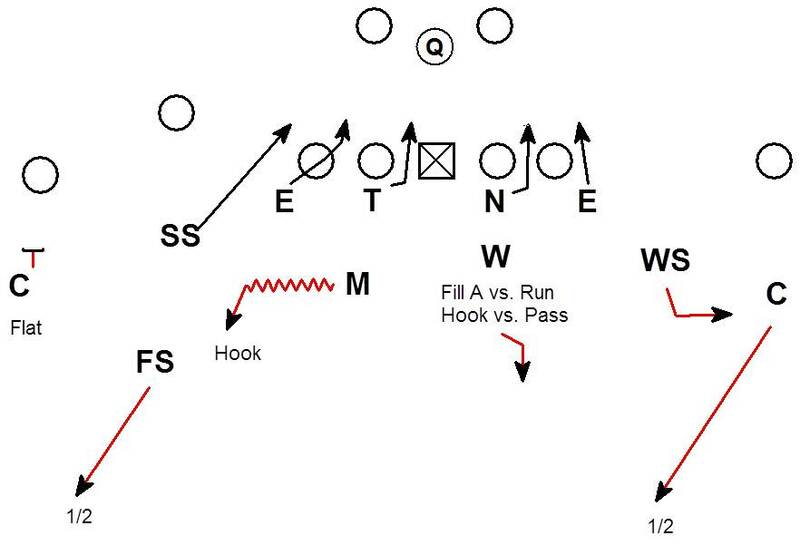 Running lead zone instead of split zone gives the offense a 4th play side blocker for the 4th defender. The offense must now find a way to control the backside DE who is unblocked. One solution is to run or fake naked/keeper concepts with the QB. The philosophy is to slow the DE down from chasing as he pauses to check the QB. One major problem develops for the offense on naked and keeper. What if the defense isn't blitzing the SS. 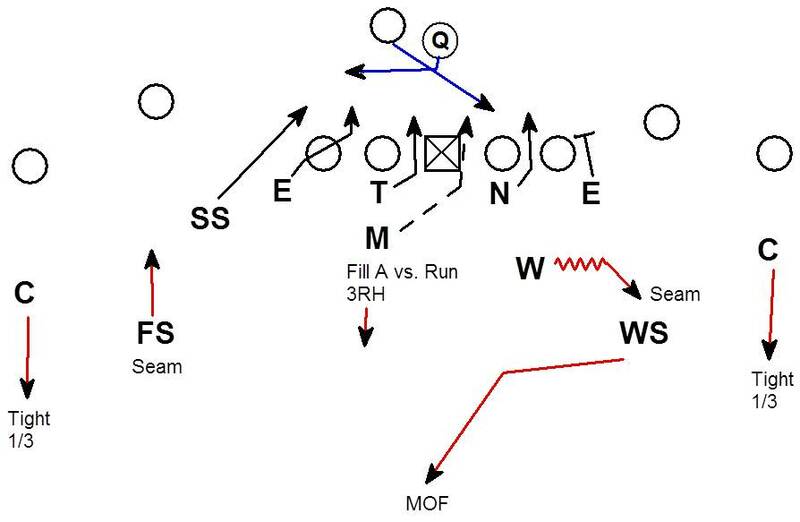 If the defense is inverting the WS, the DE can chase flat down the LOS. The WS is outside for the QB. 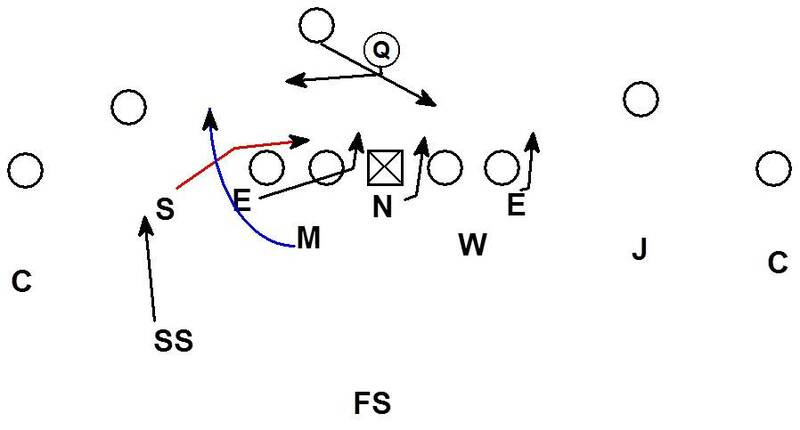 If the ball is handed off, the chasing DE has a great chance to create a negative. 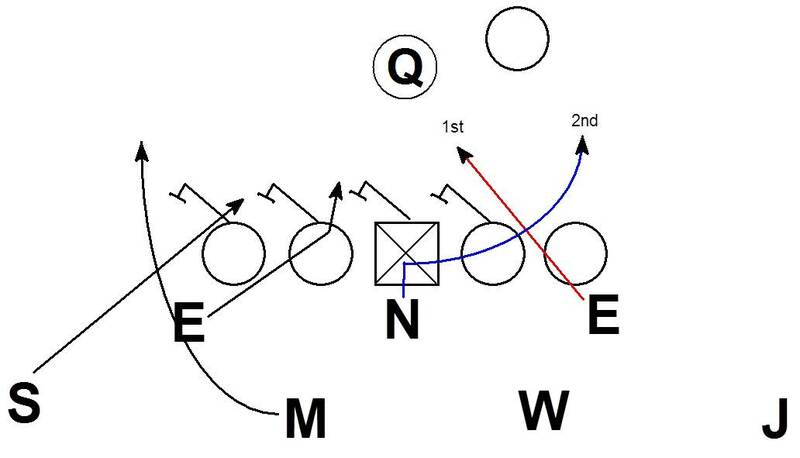 If the QB is running a naked or keeper, the WS is unblocked and has a chance to create a negative. Another offensive strategy is to use orbit or reverse motion to control the back side of the play. The FB can block the blitzer and the motion can help hold the back side DE. 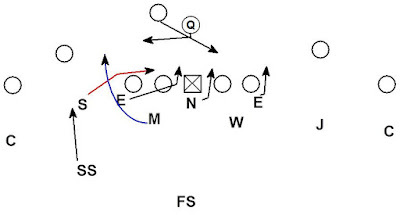 The offense however, has the same issue as before with a weak side inverting safety. The End can chase and create negatives vs. the zone run. The WS is unblocked for the possible reverse. The same issue exist when teams transitioned from 2 back to 1 back under center. If the offense doesn't have a blocker for the pressuring SS, the defense can create negative plays. If the offense has a 4th blocker to the strong side, they can block the SS. The challenge is the same as in 2 back, how to control the backside DE and WS. That brings us to zone read schemes. One of the most common 1 back solutions to control the back side of zone is for the QB to read the DE. 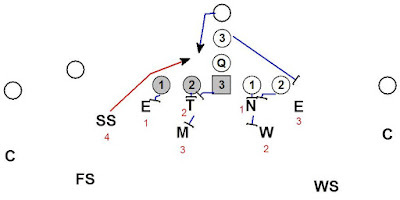 The offense can read the weak side DE and block any threat of a weak side #4. The offense still has the issue of how to block the pressuring SS. 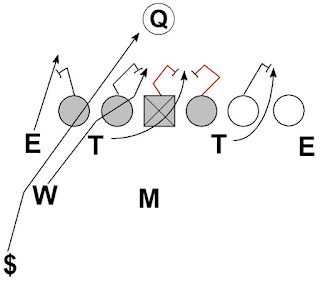 This is where the defense has to capitalize on the biggest weakness of zone read schemes. It is an option, the defense controls where the ball goes. In this case the defense wants the ball handed off into the difficult to block SS pressure. When the offense is aligned with a 4th blocker to the zone, they can block the SS. Here the defense wants to force the ball to get pulled by the QB. The inverting WS will be there to make the play. Bottom line is the numbers dictate who an offense can or cannot block. The offensive formation dictates the numbers. 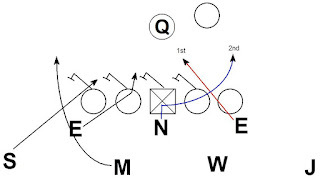 How do we design pressure to attack zone schemes? 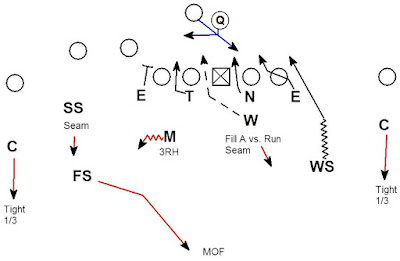 With blitz the formation concepts. This is a 5 man zone dog concept rushing either the SS or WS. Against a 2x2 the offense has a numerical problem with a SS pressure. 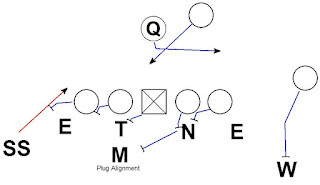 Putting the DT's in 2's and the alignments of the Mike and Will are critical to the success of the of the pressure. Putting the Tackle and Nose in head up 2 techniques forces the OL to combo. The OL doesn't know where the 2's will go post snap so the zone scheme must combo them. 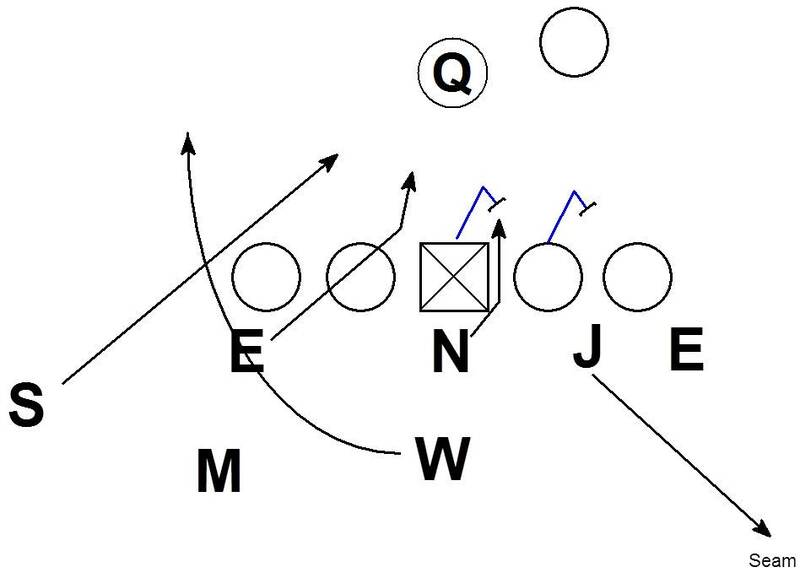 The Will aligns in the box to get the OT and OG to set their zone combo to him. 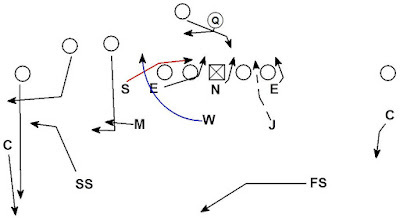 Once the QB is late in his cadence the Will can slingshot out of the box to the seam drop. The Mike takes a plug alignment at 2 yards from the LOS. His normal alignment is 4 1/2 or 5 yards deep. 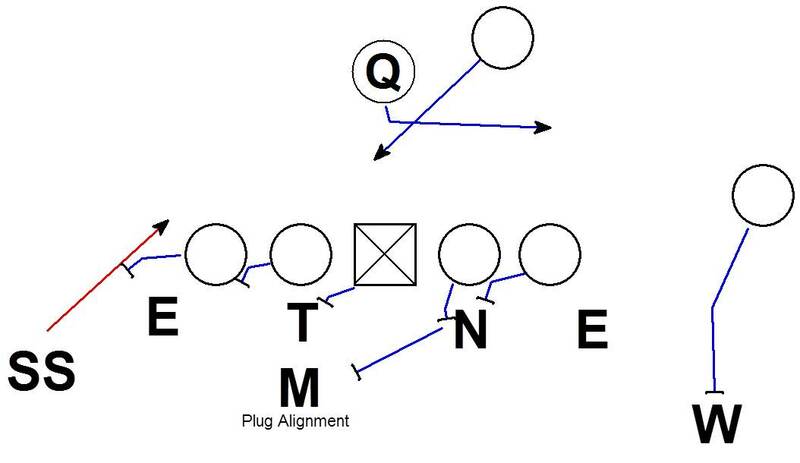 The Plug alignment forces zone combos by the OL to turn into 1 on 1 blocks very quickly. 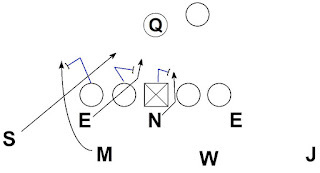 If the Will leaves the box too quickly the offense can set their zone blocking to the Mike and rushing SS. 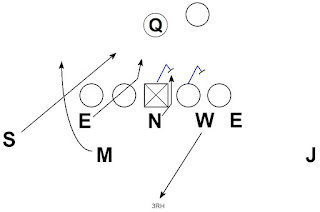 The offense can use the #2 weak receiver to block the Will. The Will holding his alignment in the box as long as possible prevents this from happening. The Mike's plug alignment is important to attacking the play as well. When the Center and Guard set their combo, we want the Center to be forced to be aggressive to the Tackle. If the Center takes an aggressive lateral step to the Tackle, it is difficult for the Center to redirect to the Mike who is filling the A gap. The plug alignment puts the Mike in a position to fill very quickly. Asking a Center to snap the ball, aggressively zone to the Tackle, and redirect is asking a lot of any player. 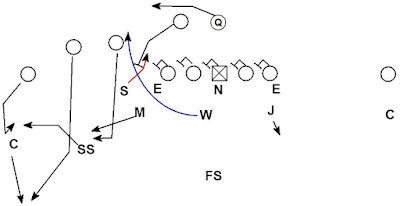 The Mike's fill in the A gap is critical to stopping the RB from winding back away from the pressure of the SS. If the the back side Guard tries to zone off to the pressing Mike, the Nose has a great chance to redirect and make a play. The Mike's plug alignment allows him to to fill quickly. The quick fill forces the guard to go fast. If the Guard is too fast the OT may not be able to take control of the Nose. 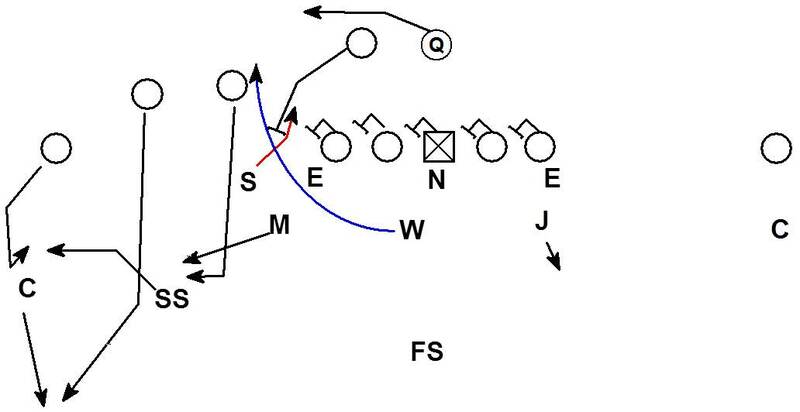 The Nose is able to redirect and pressure the RB, if the RB is winding back away from the pressuring SS. When the zone is being run away from the pressure the alignment of the Mike and Will are still important. The technique of playing into the B gap by the DE also comes into play. The offense sets their zone combos up to the Mike and Will. The End takes a 45 degree step to the the hip of the OT. If the OT was blocking him, the End would cross face and play into the B gap. In this case as the End takes his 45 degree step the OT is zoning to the Tackle. The End will stay on his 45 degree track and chase behind the LOS. The End plays into the B gap from behind the line. 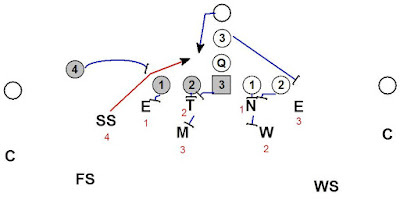 This creates a 2 off the edge allowing the End to chase down the RB and the SS to pressure the QB. As the play unfolds the Center and OT are forced to chase LB's who are difficult to zone block. The OT attempts to zone to the Tackle and up to the Mike. The Mike is able to quickly attack the run from his plug alignment. The Center is trying to combo the Nose to the Will. The Will is working out of the box to the seam technique. The end result is the Tackle and Mike attacking the midline and forcing the RB to cut back into the chasing End if the ball is handed off. The hand off should not happen as the read for the QB is to pull the ball. 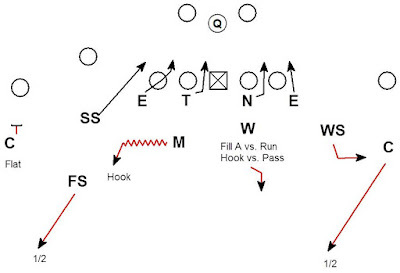 The pull should be directly into the pressuring SS for a negative play. Against a 3x1 the offense has the numbers to block the SS pressure. The pressure converts to a WS pressure vs. 3x1. The offense can block a SS pressure but now has numerical issues to the weak side of the play. 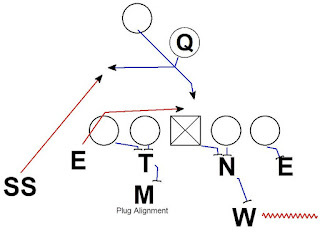 The effects of the DT's aligned in 2 techniques, the slingshot, and plug alignment backer are all still in place. The ball is handed off into an unblocked WS off the edge. Against zone to the trips the End and WS create the 2 off the edge effect creating a good opportunity to create a negative run. Offenses understand what they can and cannot block. For some the answer is to get into a 2 back split gun with the ability to create a 3x1 or 2x2 from the same formation. The lead blocker can block a SS pressure. In this situation the defense wants to be in a WS pressure. The issue is the offense can just as easily be running to the weak side. Now the offense can block the WS pressure. The defense would prefer to have 2 off the edge in a SS pressure in this case. In 2 back formations the offense has trouble with SS pressure unless they block strong. If they over commit strong they are vulnerable to the WS inverting weak. 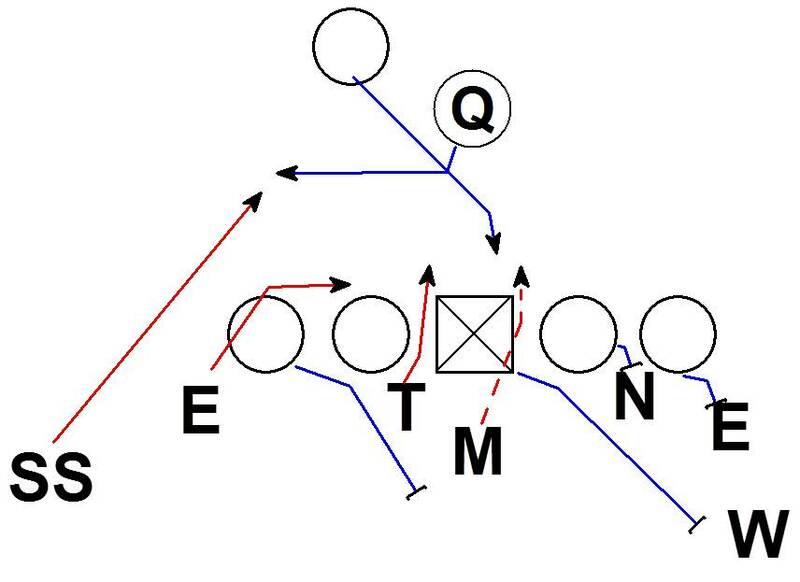 Our solution is to present both looks at once by using 4 under 2 deep coverage concept. We could also elect to play the coverage as a quarters variation. This coverage concept is some times called 2 read or Palms coverage. In either case we are able to present the offense with both a SS pressure and an inverted WS. Going to a 4 under 2 deep coverage is possible because the offense is only presenting 3 vertical threats instead of four. Understanding the defensive numbers can help create negatives when calling pressures to attack the run. Negatives plays result in offensive limitation. We want to make them play left handed. Well planned pressure can help us do that. Here is a zone dog that is a variation of America's Blitz. Mike - Rush from depth to contain. Be ready to adjust path based on how far the long stick End and Sam collapse the edge. 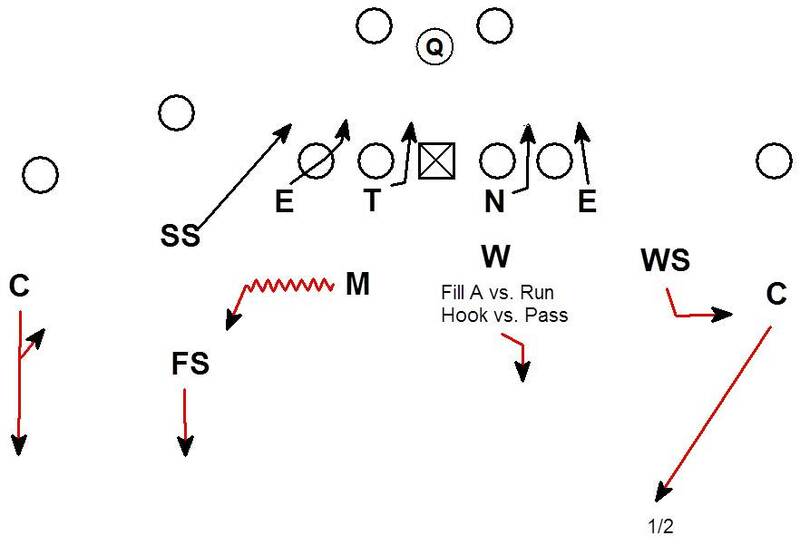 This pressure concept is good against gap scheme runs like power and counter. 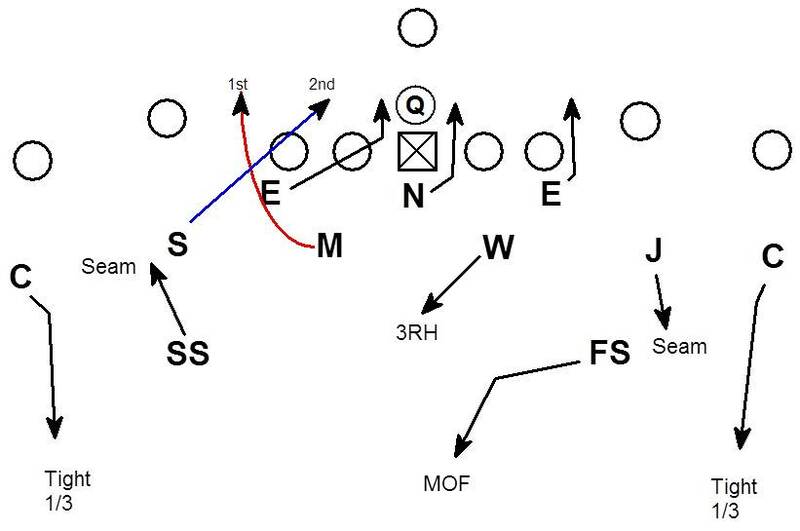 As the TE blocks down on the End, the Sam is able to attack flat down the LOS. The Sam spills the first kick out block. Hopefully the Sam is able to get both the FB and pulling guard. 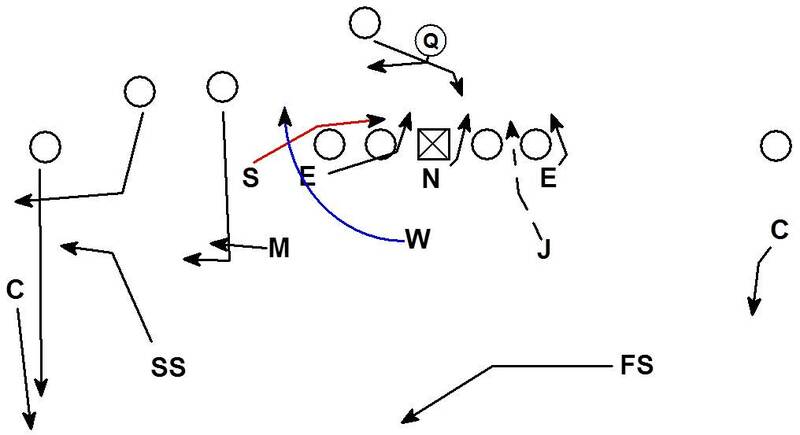 In this case the ball bounces to an unblocked Mike and an unblocked roll down SS. If the the pulling guard is able to get over the top of the Sam and FB, the Mike and SS are able to create a two on one vs. the puller. The result is a unblocked player with the ball bouncing outside. 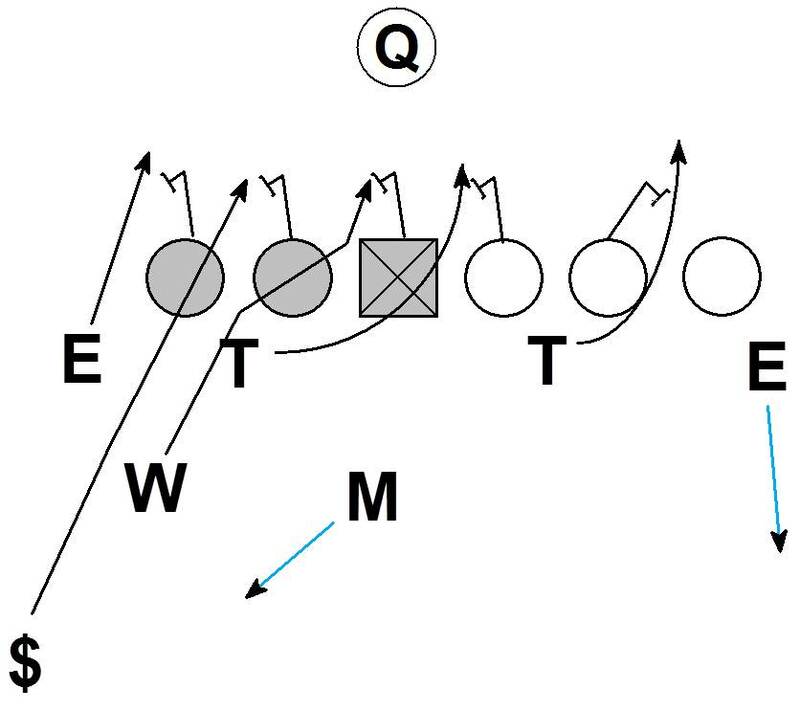 This pressure also has application against option and read plays. Against power read the Sam is walked up and is being read. The Sam chases flat which should force the ball to be handed off. The Mike is unblocked rushing over the top. Against zone read again the Sam's rush path should force a pull read by the QB into the unblocked rushing Mike. When the offense uses a 3x1 the linebackers bump and the Mike makes a "Switch" call. 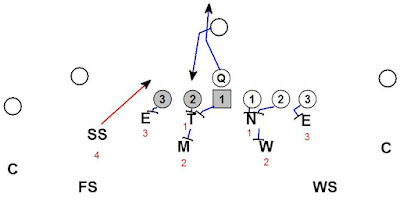 The Mike become the 3RH dropper and the Will becomes the contain rusher. The bumped Jack can fit the B gap away from the pressure or drop to the seam. 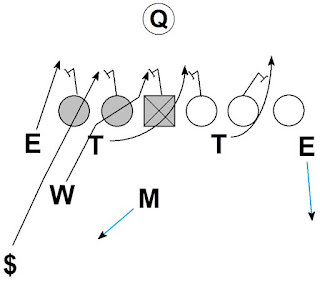 The offense has three blockers for the Corner, SS, and Mike. The offense does not have a blocker for the rushing Will. 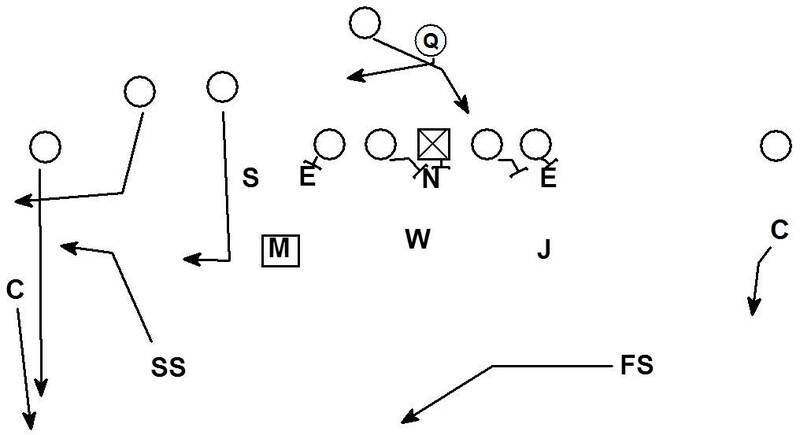 Against RPO concepts this pressure can force a run into pressure. 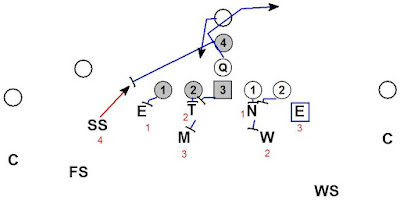 Here the offense is running a stick route and a zone run RPO concept. The Mike is the read. If the Mike fills the B gap against the run the QB will throw the stick. 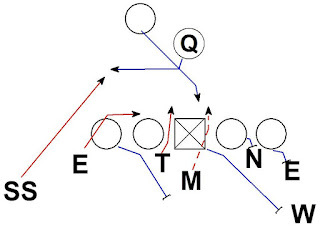 If the Mike covers the stick the offense will hand the zone run. On the pressure the Mike is free to cover the stick route. By covering the stick the Mike should force a give read. 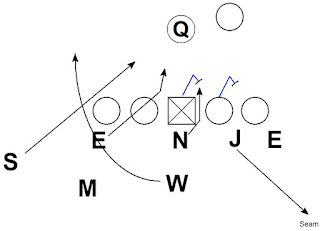 The Jack can fill the B and rushing Sam & Will can attack the zone run blocking. This pressure concept also has pass rush applications. Against sprint out the pressure is effective at creating a two on one vs. the RB. The RB is blocking the first threat off the edge on sprint out protection. 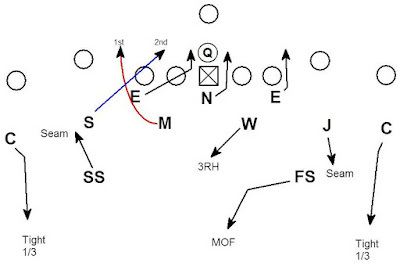 The Sam attacks and is free to undercut the RB. If the QB sets up inside the RB's block, the Sam is there to apply pressure. 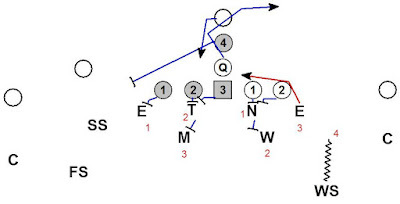 If the Sam forces the QB over the top, the Will is there to apply unblocked contain pressure. 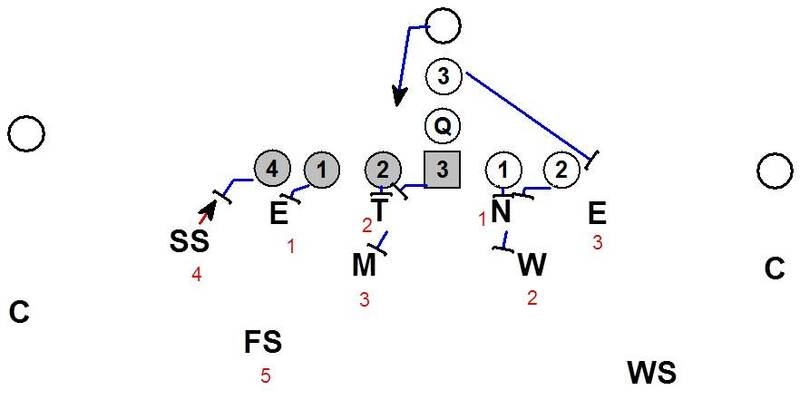 The coverage is sound with three droppers to cover the route combination. Don't forget to follow Blitzology.com on Twitter.